Over the past decade, two primary obsessions have dominated Josh’s life...brains and banjos. By day he’s a practicing Neurologist in Atlanta, GA. By night, a husband, father, and incessant banjo noodler. 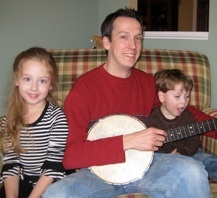 As part of a diabolical plan to apply his knowledge of developmental neurobiology to mold banjo crazed children, Josh created his first children’s banjo album for his daughter Jules when she was born. Results thus far are promising. Now, with banjos for babes volume 1, he’s decided to share these creations with the rest of the world, hoping to spread banjo induced peace and harmony to all children. Cynics believe this is just a convenient excuse to buy more banjos. Josh can also be found playing old-time banjo for the sedentary ramblers. When not playing princesses or digging for roly polys, Jules kindly lends welcome vocal support to banjos for babes. 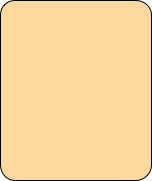 She is also our artist in residence, providing all the original artwork for banjos for babes, and, along with her younger brother, provides invaluable market research feedback. At just the age of one, Tucker has already shown a remarkable aptitude for stringed instrument setup. He has independently discovered several methods for “enhancing” an instrument’s tone, including running a toy train down a banjo fretboard, and filling the inside of a guitar with crayons. Not only is she a mom, chef, educator, event planner, and banjo addiction enabler, Jenn is also the glue that holds the banjos for babes team together. Visiting us from his home in Austin, TX, everyone’s favorite guitar playing uncle makes a special guest appearance on “Old Dan Tucker”.